Message restrictions on your Exchange groups preventing emails to be received? A common problem I get support tickets on is distribution groups not receiving emails from non-Exchange systems. There can be various reason for this, but the first thing I do is check the mail flow settings for the group to determine if the group is restricted to only authenticated users. When groups are created in Exchange 2010, the default settings are applied and off you go, ticket closed. What is often overlooked are the mail flow settings for the group. 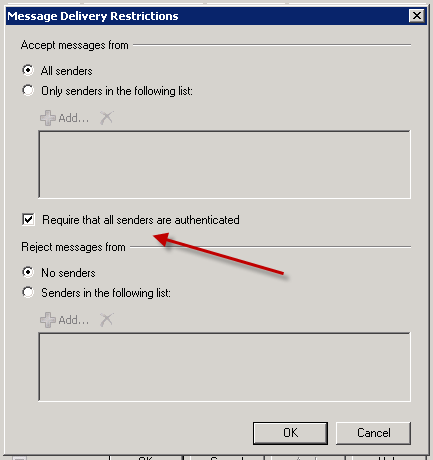 The mail flow settings control who can send to the group, which senders to reject messages from and require that all senders are authenticated. Typically this not an issue if you’re sending emails to the group in Outlook, but if you want to send emails to this group from outside of the Exchange system, you will want to make sure that this is not enabled. When the “require that all senders are authenticated” is enabled it prevents any users that don’t have valid logon credentials in your organization from sending emails to this group. If you have servers in your environment that need to send emails to an Exchange group, you will want to disable this setting since that server is not authenticating. If the groups were created prior to Exchange 2010, this setting was not enabled by default therefore there were restrictions. You can disable the setting by 2 ways, through Powershell or the Exchange Management Console (EMC).